A small Vermont farm demonstrates how adapting to climate change can also provide community benefits. There’s a small farm near Burlington, Vermont, that was originally used to grow feed and raise cattle. Surrounded on three sides by rivers, the farm experienced seasonal floods. The flooding was predictable though, so farmers could plant corn after the water receded. But not anymore. Recent changes in the local climate include more frequent and severe rainstorms. Without a clearly defined “wet season,” growing feed and raising cattle is now impractical. So three years ago, the Pine Island Community Farm bought the property and began leasing garden plots and raising goats. Farm project manager Karen Freudenberger says they replanted the floodplain along the river with perennial shrubs – restoring the wetland meadow that was there before the land was planted with corn. Restoring native plants has provided food for the goats. And because the fields are no longer plowed and fertilized for corn, there’s less sediment and fertilizer washing into the river, improving water quality. It’s an example of how smart climate change adaptation can improve both the community and the natural environment. 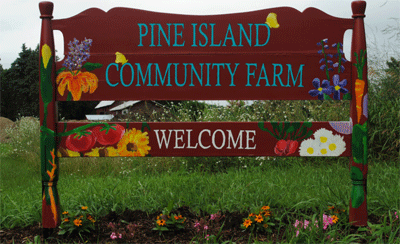 Photos source: Pine Island Community Farm website.